Did you know there is an official soundtrack to this story? You can listen to the exploits of the notorious Captain Stark and his squalid crew of sea rogues on Rustmonster’s first album: Last Voyage of the Black Betty. To purchase the official soundtrack of this album, click on this link: pirate music. What would a Caribbean pirate band sound like today? 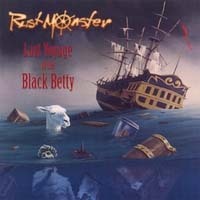 Rustmonster is the definitive example of pirate music dragged kicking and screaming into the 21st century. With two pirate themed albums in their book: Last Voyage of the Black Betty and The Flight of the Filthy Vicar, Rustmonster has quilled their place in the growing genre of modern pirate music. for more information about Rustmonster, click on the following link: pirate band. Now on with the story. The Boar’s Nest was a dismal tavern with begrimed tables and a miry floor, covered with a paltry scattering of sawdust to hide the tobacco, blood and whiskey. Every seedy, gawk-eyed scamp who ever crawled out from under a West London box eventually made his way to the Nest. Frequenters of the Nest squandered their last shillings for a sip of watered down tipple–a few moments of pleasure in their otherwise sorrow-infested lives. Among the Nest’s habitués were the heartless, the refused and the wicked. There never was a non-culpable man to visit the Nest, the barkeep would often say with a burlesque laugh and a sip of ale. One balmy June night in the year of our Lord 1618, the good lieutenant of The Black Betty, accompanied by five hands, crunched his boots on the stoop of the Boar’s Nest and slammed the bat-wings wide. His name was Jax, an evil-tempered sailor with no patience for landlubbers. His commission, that humid, London eve, was to impress 20 men into service under The Black Betty’s captain, Stark, the coldest hearted pirate of them all. There was a quell in the raucous dance and song as all eyes turned and recognized the hard skinned man wearing a black vest, his arms undulating with muscle and sinew. “I’ll be needing a few volunteers.” Jax said, his voice like a storm. The Nest exploded as men left their chairs to find quarter; for none desired to sail under Stark with his mane of silver hair and his sunken eyes that could stop a man’s heart with one icy stare. Jax and his hands drew saps and moved into the fray, their teeth barred into maniacal, twisted grins. Within the hour 20 men had been impressed, their unconscious bodies lying in a line along the waist-deck of The Black Betty. Stark glowered down at his new volunteers from his perch high on the quarterdeck. With the volunteers impressed by Jax, his ship was fully crewed; it was time to make way. “Make way, Mr. Jax.” Stark gave the order to his bosun as if it was nothing more than a light request. That night, under the ghostly light of a three-quartered moon, The Black Betty made way on her last voyage. With the wind at her port beam, The Black Betty sliced through the surf, making excellent time, tacking along at an average of 8 knots. She moved like a native of the water, a fully square rigged frigate, beautiful, with a sleek, shallow hold for speed and mobility. The sun dipped in the distant, western horizon. The second dogwatch had taken control of the ship. A foursome of mid-shipmen played a spontaneous game of dice, wagering with extra shares of rum that the quartermaster had provided. The men laughed heartily as they drank some and gambled some away, careful to not slog too much down their gullets lest they lose their wits. Captain Stark stood on the quarter-deck, his prematurely silver hair blowing in the crisp, sea-air. He leaned against the port rail and allowed the briny mist to moisten his pale, Scandinavian skin. As Captain, Stark was a unusually young, only in his early forties. But as a pirate, he had the right to throw in his lot for captain. According to the code, the crew decided by lots who would captain and where their ship would take them. Stark felt comfortable as captain. But, as of late, he couldn’t help but view piracy as a petty endeavor. Land-lubbers believed that pirates amassed large fortunes in Spanish silver and other currencies; Stark had long learned to separate that notion from reality. Like any path to fortune, pirates worked hard for every shilling. From most merchant ships, Stark was lucky to loot a stock of precious fabric, beans, tea or grain. The business of piracy seemed to be just that, more business than adventure, more buying and selling, more diplomacy at port, and much more running and hiding than enjoying one’s profits. And when his crew had wrested the occasional big haul–pieces of 8, doubloons, gold–inevitably, they squandered it at port on whores and alcohol. Stark wanted more; and he thought that he had found his path. He held a parchment in one weathered hand, rolled and folded once. A half a year ago, back in Barbados, while his crew had busied themselves spending their shares, engorged their bodies with runny meats and fats, while they had swilled on the most exorbitant, imported wines, Stark had met an ancient, a man simply known as Ah Kahn. He had first heard of Ah Kahn from a man he had met in French Guiana. Luca had been the man’s name, an old ex-French patriot, turned prate. Luca had told Stark about Ah Kahn. “What’s a day-keeper?” Stark had asked, buying Luca another drink. “Word is Ah Khan is a man who can.” Luca drained the last of his ale and slammed the glass down on the chipped bar. “I’ll take another if you please.” He asked the barkeep. Stark unrolled the parchment and looked it over. He had studied every inch of the parchment, trying to unlock it’s secrets. But it had been inked in a dying language; and it’s arcane, sketched diagrams, which Stark guessed made up a map of some sort, could not be deciphered. But there was more to the map than mere parchment and pen. The words, made up of crude hooks and daggers, seemed to beckon to Stark, to beseech him to understand them. The map had become Starks obsession, though he had quelled it. To bring superstition of any kind aboard The Black Betty could exact terrible consequences. For each man had his own set of fears, all grounded in the supernatural. They would gather and kill Stark if they suspected him of cursing the ship. The mystery in the map, in its diagrams, in its imagery, perplexed Stark. And there was only one man in the world that Stark knew of who could read it, a man who lived at least a month and a half’s sail from where The Black Betty cut through the open seas. Stark had to somehow get back to Barbados–back to Ah Kahn. The day cabin stunk with the smell of fifteen men. None had bathed in days and the stench choked the senses. Stark breathed through his mouth to fight against the malodor. The captain’s day cabin had once been an elegant place, fitted with intricately carved relief in oak and fine art, which had hung on every wall. The Black Betty, in another age, had been a ship of the line in The Royal Navy, her decks pristine and manned with well-trained uniformed men–men enlisted to fight at sea against the French. Her decks no longer gleamed with the sheen of frequent scraping and bathing with disinfectants. Since the day The Black Betty had been captured and dragooned into piracy, her day cabin, along with the rest of the ship, had fallen to shambles, having been the home of 5 cantankerous captains, each more boorish than the last. Stark had called the meeting. He looked over those in attendance, counting heads–all were present–officers and a few midshipmen. He spotted Jax near the exit, bare-chested, low browed and brooding. He spotted Ian, the Englishman, his most profound opposition among the otherwise submissive crew. Like Stark, Ian read books and occasionally wrote letters. The rest of the men were nothing more than pawns to the promise of fortune, inert objects that seemed to show no personal power of which to speak–each of them required the persuasion of a master in order to act. “There is nothing to discuss.” It was Scree, the navigator, who spoke from deep in the throng of bodies. “The wind is at our beam. We are already two days sail on route. To change course now would be unlucky.” There was a general din of agreement as men nodded heads and offered concurrent grunts. “How have things changed?” One of the men, a burly mid-aged sailor with red, sun-burned skin said. “Halmstad has a ripe fruit, a war chest. Isn’t that right, Ian?” The man appealed to Ian. “And that ransom will be ours.” One of the men shouted. Others punctuated his outburst with a volley of grunts and cheers. Several of the men licked their right forefingers and spotted their brows at the mention of their dead captain; for none desired to summon his ghost up from the deep. “What alternative do you present? We have parleyed and decided on Halmstad as this ship’s destination.” Ian said. The crew settled, all eyes on Stark. “Such a place does not exist outside of legend.” Ian said, waving his hand to dispel Stark’s words. “Pray, tell us where, and shall go there.” Ian said, flourishing mockingly with one hand. Some of the pirates chortled, rocking back and forth, their laughs lecherous and grinding. The room went deadly silent for a long moment as each man imagined bags full of gold and rooms full of silver. “But what if what he says is true?” Yeates, a spindly man at the back of the room said, his voice wispy from an old wound in the throat. “What do you stand on?” Ian asked the spindly sailor. “I stand on my feet.” Yeates said unsurely. “It’s not superstition.” Stark said. “I don’ speak of El Dorado.” Stark spat. Some of the men laughed, uncouth and rustic. Each of the fifteen men reached into his pocket and drew out a length or rope tied into a monkey’s fist, a ball of a knot with intricate circuitous chords. Two knots flew over the crowd and landed on the center table, that of Stark, and that of Jax, Stark’s lieutenant. Stark looked across the room at Jax. The big man nodded at the captain, his eyes nothing more than slits. Stark could always rely on Jax’s loyalty. Thirteen knots flew and landed, thumping, on the center table. Although the lots had fallen almost unanimously in Ian’s favor, there was an undertone of trepidation in the air; all knew the cunning of Captain Stark. They knew his viciousness with both his sword and his wit. It was because of this viciousness that he had been voted in as captain in the first place. Though they had all decided to follow him, none desired to cross him. Ian turned to Stark with a smug smile traced across his lips. “And so the men have spoken.” He spread his hands. The Black Betty carved through the brine like a shark’s fin, its hull slick and at home in the water. She traveled at a steady 9 knots with the wind at her port beam–perfect conditions for a sailor of any persuasion. The late afternoon sun dipped in the distant, western horizon, its heat igniting the wispy clouds and setting the sky on fire. The conflagration of sky reflected on the choppy water in swelling, orange and read paintbrush strokes, each swell capped with a goodly top of white foam and oceanic mist. Saul Cappa and Henri Raye leaned against the starboard railings of the spardeck, watching the sun as it began to dip below the distant horizon line. Saul’s mother had named him after the apostle. She had clutched a bible to her breasts through the pain of his birth, praying that The Lord would spare the boy’s life. He had come from her womb twisted and breached, causing him to suffer a brief depravation of oxygen. Though her praying had seemingly saved the baby from the perils of birth, they hadn’t saved him from a doltish mind and occasional seizures. Saul had spent his teen years and early 20’s in an institution for the insane where cruel tortures were used in an attempt to save the boy’s soul. In the end, he had escaped. After living as a vagrant for two years on the streets of West London, he met an old pirate, at port searching for crew, and finally found his place. For two years Saul had sailed on The Black Betty, working under the authority of two captains; Frankie Drosdan, and Campbell Stark. To Saul, both captains had been equally vicious, but equally fair. Both had captained The Black Betty into adventure and fortune, filling the pockets of her crew. But Saul had no money of which to speak; like most of the crew, he had squandered everything he made a port. Never in his dreams had he dared wish for the pleasures he found at port and for the men who acted as his mentors to delight–guides to help him experience a wide array of sweets and joys–of flesh, food, and violence–sometimes combinations of the three. But pleasures at port and pockets ladened with wealth were not the reasons Saul remained dedicated to The Black Betty. He had joined the crew for acceptance–admittance into a circle of friends–the crew of The Black Betty was his family. “Stark has lost his mind if you ask me.” Henri said, taking a bite out of an apple he had taken from the galley. “We go where Stark wants; we go where Ian wants. The end result is the same?” Saul said. Saul felt Henri’s muscle–hard and taught. “What about God?” Saul asked. “God is preoccupied.” Henri took another bite of his apple. “You don’t believe in God?” Saul asked. A long moment passed as the two men watched the distant sun sink. It burned, hot and vibrant, as if it hoped to expel every ounce of its fiery strength at the last moment before it finally disappeared. “Tell me about the girl.” Saul said. Henri closed his eyes and took a deep smell of the brine, which he had long learned to love. He loved to sail. He loved piracy. He never thought anything could take its place; but that had changed two months ago when The Black Betty had ported on Grand Cayman for careening and for the sale of her swag. “She’s a princess–an angel.” Henri said, the corners of his mouth curling up into a slight smile. “Tell me about her.” Saul asked. “I don’t know her name. I only know her by her beauty.” Henri closed his eyes and imagined her standing before him. She wore a white dress, made of fine fabric and lace. Her hair, in dainty curls, fell over her shoulders and cascaded down her back. She wore white cotton gloves and held a parasol to keep the sun from her skin. Mostly he remembered her smile, luscious and full-lipped, her teeth, white and perfect. She was an island girl refined, taken into the care of the Britains. They had shaped her into a lady. Henri had spent two weeks with the girl, holding her hand, walking the beaches with her, kicking foam and laughing. She had tapped into perhaps the last trace of soul, the last spark of humanity in Henri Raye’s long darkened heart. Somehow the island girl with olive skin had blown on that spark and ignited a fire. But as quickly has his love for the girl had bloomed, the bos’n had called and Henri had left her. But he had promised that he would return. He kept her memory with him. On cold nights when his hammock swing on the gun deck, his body crammed between two smelly men, listening to the breathing and grunting of the uncouth and begrimed, he thought about her. Her memory brought sojourn to him on those cold nights, and on the hot days when he faced his duty to the ship and crew. Jax lay in the hanging cot of his officer’s cabin. A book sat open on his lap. For more than a month he had struggled to make out the cryptic shapes of letters and form them into words, but he just couldn’t seem to get the knack. To smart men like Stark and Ian, reading seemed to come easy. Jax was not an educated man, but he was no fool. He knew the benefits of reading. He had beheld the reason behind Stark’s eyes. He had witnessed Stark, on more than one occasion, change the mind of a man with nothing more than wit and words. Jax longed for the same skill. He had purchased a grammar book back in London and, without telling a sole, begun to teach himself letter by letter, sounding out the shapes with his tongue, forming his first fledgling words, a, at, the… In time, he would master it. A healthy knock at the cabin door roused him from his book. He hurriedly tipped himself out of the hanging cot and tucked the text under the lid of a sea-chest in the corner of his cabin. He crossed the room and opened the door. Stark stood in the hallway, gaunt and hook-nosed, hands folded behind his back, his prematurely silver hair tied behind his neck in an orderly pony tail. Jax swung the door wide, admitting the captain into his cabin. Stark walked to the middle of the room and glanced around, a kind of spontaneous inspection. He noted Jax’s orderliness. The Lieutenant’s quarters were cleaner than most cabins. Jax’s belongings were securely stowed or hung in shipshape on a series of hooks along the wall. Clothes and linens lay folded and on a makeshift shelf Jax had fashioned out of scraps from the ship carpenter’s store. “You keep an orderly cabin.” Stark said. “And why is that?” Stark raised one eyebrow. “I believe a good captain should be learned.” Jax said. “What do you propose?” Jax asked, his eyebrows arching. “And what would that be?” Jax asked. “There’s a good lad. Good fortune always awaits men of such unwavering loyalty.” Stark put a hand on Jax’s shoulder. The skin of Stark’s hand felt hard and cracked, worn with years at sea. Stark had the hands of a seasoned sea dog, long toughened by the grind of ropes and the salt of brine. Stark looked deep into Jax’s eyes. For the briefest moment Jax saw something foreign in the Captain’s countenance, not quite desperation, not quite madness, perhaps a mix of both. Stark wheeled around and left Jax’s cabin without another word. Jax stood for a moment, considering what Stark had asked. He didn’t doubt Captain Stark’s lust for gold. He didn’t doubt that if Stark led The Black Betty to fortune Jax would get his fair share. But there was that trace of, what was it? Madness? In Stark’s eyes. It took a touch of madness for any man to lead the life of a pirate; but there was more to it than just madness in Stark’s vacuous stare. It seemed as if Stark had been possessed by an unseen demon. Jax shrugged it off. Stark had always been mad; Jax had stood witness to it many times. In battle, Stark often quoted scripture as he hacked men to chum. He had once cut a man’s heart out for cheating at bones. Stories of Stark’s cruelty and occasional dementia abounded. To Jax following Stark brought more than fortune, it brought a taste of what devil offered; and once a man sampled the devil’s wares, there was no quelling the hunger. Jax opened the lid of his sea-chest and picked up his leather bound grammar book. He reclined in the hanging cot and opened the book to the consonant letter K. As he read a sentence, The kite flies. He felt satisfied with himself; after weeks of study, he was finally understanding the mystery of words. The early full moon cast a sheen of light over the Kattegat. Flecks of it danced off the near calm water like a million diamonds winking in rhythmic patterns. Stark stood on the bridge of The Black Betty, squinting, trying to get a read on the bay. The land, thick with foliage, blended into the night, camouflage, almost part of the sky. A dense, almost impregnable forest of deciduous trees clogged his view to Halmstad; yet he knew the town must be close. Stark imagined her residents tucked in for the night, their fires cold, their oil lamps long extinguished. They undoubtedly slept. Unquestionably their guard would be down. But Stark still reasoned that any fight with Halmstad would not be met without resistance. The Danes had been at long war with the Swiss. Only lately had an uneasy peace been reached between the two reckonable forces. “Depth, Mr. Scree?” Stark asked his navigator. Jax nodded once and pointed to a quartet of crew who stood around the capstan. The men understood. They put their backs to the wheel and slowly lowered the anchor. “Where’s my cockswain?” Stark asked, glancing around the quarterdeck. “Here, Captain.” A burley man with stringy hair and only four fingers on his right hand climbed the short ladder that led up to the quarterdeck. “Yes sir,” Jax said with a nod and descended the short ladder to the spar deck. Five hours later, under the blanket of night, The Black Betty skirted the edge of the Kattegat and cut towards the outlet of the Nissan river, only her gallant sails bent, the rest had been furled and tied. Scree clutched white knuckled on the wheel, his palms slick with sweat. He glanced over his shoulder at Rhett, his first mate, whom he had set to monitor the depth. The Black Betty hadn’t been built to travel rivers. This was a task better suited to galleys, not a fully square rigged sailor. Stark had stones, that much couldn’t be argued. “Three fathoms.” Rhett said, trying his best to stay calm. “Keep a steady eye, we don’t want to run her aground.” Stark said, keeping his eyes forward, scanning for any sign of civilization. “What are you doing?” Ian peeled out of the dark, climbing up onto the quarterdeck. “T’is already set in motion.” Ian seemed to be crawling under his skin in either fear or rage; Stark relished it either way. “Two and a half fathoms.” Rhett said. “Steady, Mr. Scree.” Stark kept his eyes on Ian and wore a smug smile. Jax nodded, leaned over the rails, and gave the orders to one of his mates. Five men leapt into action, climbing the rat-lines like monkeys, making their way to the bending gallants. “If you ground this ship, we will be taken and hanged as pirates.” Ian spat. “Yes, captain.” Jax left the quarterdeck, climbing quickly down the ladder. Henri Raye led one-hundred men through the bush. Each man held a small cask of powder and the weight of a matchlock and cutlass. At several points they stalled, having to bushwhack their way through brambles and thick foliage. Henri thanked the fates for a full moon. In pure pitch, there path would be impossible. “How much further?” Dex asked. Henri smiled. He loved the boy, only sixteen, still full of youth’s zeal, although his innocence had been stripped from him since he and Saul Cappa had found him as a near infant in a cardboard box, buried in the trash, deep in the dregs of London’s downs. Dex had been taken aboardship and literally raised by pirates, fed from the milk of goats, stocked on board until he could eat meat. Henri believed in his heart that they had truly shown the boy to a better life, they had rescued him from exposure and death and led him to glory. “Stark estimated one and a half miles. By my reckoning, we should see cottage lights at any moment.” As if on cue, flashes of lantern illumination peeked through the trees, their red and yellow fire dancing like pixies, winking and taunting. Henri raised a hand and the rest of the company stopped, pushing up behind him for instructions. “Gentlemen, we are on the edge of either fortune or death. Stark warned that this place is no stranger to hostility and that they no doubt have arms to spare. We must blend. We must be the shadows. We will divide into groups of four and deploy our tasks in silence and with all speed. Stark awaits our signal. Saul walked only yards behind Henri, his cask of powder getting heavier by the moment. “I is here.” He said. “You remember how I’m always telling you to control that monster in your head?” Saul had, with his dim mind and almost inhuman strength, nearly killed a mate on more than one occasion. It was Henri who had first told Saul that he had a monster living in him and that he had to control it. Saul had taken Henri’s metaphor at face value and, ever since, thought of himself as a cage for a ferocious beast. Sometimes the beast got out without his permission. Sometimes he controlled it. Saul’s relationship with his inner beast teetered on a tight line. Most of the crew distrusted and even feared Saul. Henri understood him and had become the moron’s friend. “I am simple, but strong; that’s what you always tell me.” Saul said. “For me mum?” Saul asked. A hundred pirates, let by Henri Raye, passed through the forest to the edge of a clearing. There, standing before them in majesty, was Halmstad, more than a hamlet, a city. They paused a moment to crawl over the establishments, businesses, and homes with lecherous eyes. Halmstad stood vast and daunting, though nestled in sleep. Her streets, wide enough to allow three wagons side by side, were vacant. Sporadic oil lanterns hung high on posts along some of the main city streets, a probable deterrent for thieves and drunkards. Suddenly the task of sacking Halmstad seemed more difficile than Henri and his large band had expected. Halmstad was no petty village. The small army of men hesitated at the edge of the clearing, but only for a moment; for, as Henri had said, their lust for lucre outweighed their fear. Group by group they deployed, four in each band, fanning out, armed with powder, matchlocks, cutlasses, and rage.